5/26 Cup of Coffee: The affiliates were swept on Friday night, but there were some notable performances for each affiliate. 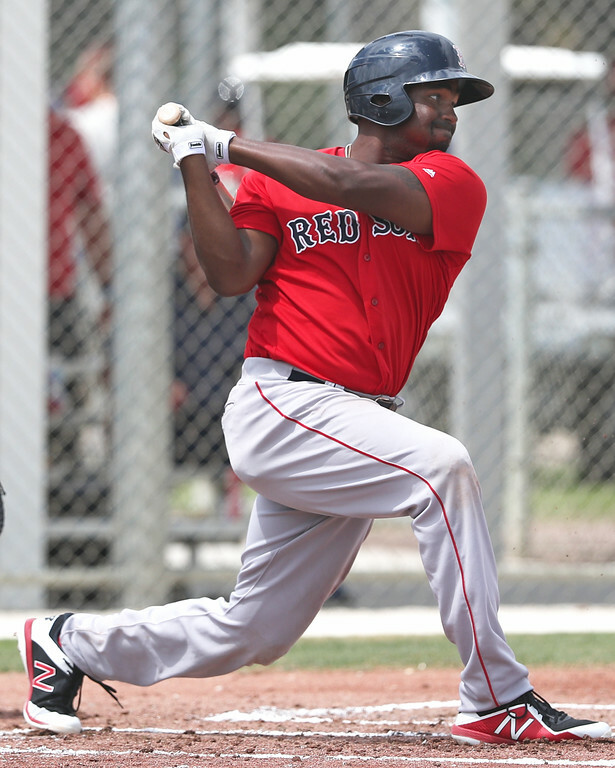 Sam Travis and Bobby Dalbec hit home runs, Josh Ockimey (pictured) had three hits, and Mike Shawaryn, Darwinzon Hernandez, and Alex Scherff had some highs and lows. The slide for the PawSox continued as they fell to the IronPigs in the first game of a five-game series. Marcus Walden was hit hard as his ERA ballooned to 7.50 after allowing four runs over 2 2/3 innings. Robby Scott was able to keep Pawtucket in the game with two scoreless innings while striking out three. Sam Travis and Rusney Castillo each had strong nights, with Travis launching his third home run while Castillo added two doubles and an RBI. Mike Olt had two hits and a walk as he raised his OPS over .900 with the PawSox. The ball was flying out of Hadlock Field on Friday, as the two teams combined to hit nine home runs. The Sea Dogs accounted for three of them with Jeremy Rivera, Jantzen Witte, and Tony Renda all going deep. Tate Matheny added two doubles and Josh Ockimey had two singles and a double in five at-bats. Mike Shawaryn made it out relatively unscathed with the offensive fireworks as he allowed two runs over five innings, walking one and striking out three. Jake Cosart was not as lucky as he gave up five runs while recording five outs. After starting the year with 11 scoreless innings, Cosart has now allowed 19 runs over his last 9 1/3 innings. Darwinzon Hernandez improved his control, but a rough third inning dropped his record to 3-2. Hernandez allowed four runs, three of which came in the third, over six innings, walking two while striking out four. He has walked only three batters over the last 12 innings, but he has also allowed six runs over that time. The offense only managed four hits on the day, with Bobby Dalbec slugging his ninth home run of the year, and Jerry Downs went 1 for 3 with a walk and a double. A solo home run from Jagger Rusconi was one of only three hits for the Drive as the fell to the Fireflies. Alex Scherff fell to 0-4 after he allowed three runs over five innings. He walked one and struck out five, and he's walked three and struck out 12 over his last 15 innings, which is a big improvement from his rough start to the year. Angel Padron followed with three hitless innings.